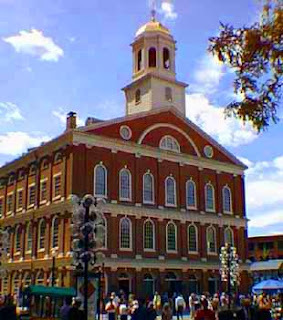 Those of you who just want pure shopping, dining and entertainment in Boston, the best place to go to is in Faneuil Hall Marketplace. There is no magical place in the center of Boston such as this ;). - it combines the glories of Boston's past with the urban sophistication of the city today. Just a step off the freedom Trail, the marketplace is within an easy walk to the New England Aquarium, Museum of Science, Paul Revere's House, and the Boston Common. The marketplace is as well a home to over 40 nationally known and locally loved shops offering a unique selection of jewelry, formal and casual clothing, accessories and giftware. For fine dining options, there are 16 restaurants, and the Quincy Market Colonnade's 35 eateries boasting international flavors and local favorites. Whether it's a power-lunch, a friendly get together, or a special romantic dinner, the Marketplace provides a range of upscale and casual dining alternatives. World renowned street performers are captivating with their hilarious comedy routines, musical fanfare, etc...take time to meet them on the streets! :).